I’ve always loved makeup. I’d go through the drugstore and be amazed at all the different options and dream about buying an $11 foundation. (If only I could see into the future where I’m spending triple that!) While I had a lot of makeup and loved using it, I was obsessed with looking natural. A lot of the other girls in my school had clumpy eyelashes, orange skin and thick eyeliner and I wanted mine to look more natural. Unfortunately, my idea of natural was pretty horrific. My senior year I decided to splurge on a foundation so I walked into Ulta and asked one of the workers there to recommend one to me. I’m pretty sure I told her I have oily skin for some reason, but I don’t know why as my skin tends to be on the drier side. Anyway, she matched me with the Urban Decay Naked Skin which clung to my dry patches and made me look super-matte, which is a look I don’t like. I suffered through bad skin day after bad skin day for the rest of the year because I had spent so much money on that foundation and didn’t want to waste it. My concealer game wasn’t as bad. I didn’t have acne-prone skin so my main area of focus was my undereyes, where I piled on three different types of concealer, including one that was meant to cover tattoos! At least one of them was a pinky-toned one so it balanced out the other stark-white ones I used. I blended that pretty well and that was it for my face makeup. I didn’t know what contouring was so I skipped that, I was scared to use bronzer so I skipped that, and my skin had always looked red to me so I usually skipped blush, too. My face most likely resembled the moon: pale, round and dry. Moving on to my eyes, I only used one eyeshadow at a time and I rotated through my collection. Some days weren’t bad with just a shimmery gold shadow all over the lid. Other days I wore dark blue shadow like a liner on my upper lash line. I don’t like to talk about that. My liner and mascara was both kept minimal. If I wore anything heavy I would end up looking like a raccoon at swim practice! I wore a black or dark brown liner on my upper lash line and wore one coat of mascara, carefully brushed so that it wasn’t clumpy. To this day I don’t wear eyeliner on my waterline or lower lash line; it makes my eyes look smaller and my face rounder. I didn’t do anything to my brows, but they were much thicker than they are now. I started getting them waxed about twice a year starting when I was a junior, but my first two years I looked like I had two thick caterpillars over my eyes. It was horrific. For my lips I was obsessed with pink, usually a pale pink or a Barbie pink. I loved Revlon’s Stormy Pink and L’Oreal’s Pink Flamingo. I still have both but I rarely wear them because I don’t like the formula much. Stormy Pink is a very drying matte and Pink Flamingo looks very cheap to me, plus it sticks to any cracks in your lips. I wouldn’t wear either of these shades the way lipstick is supposed to be worn. I would put it on, blot off the excess, and then rub it into my lips with a finger so that it looked somewhat real. To top it all off, I wore a ton of perfume and scented lotion, and I had braces for three years. Thanks for reliving the cringe with me! Was your high school makeup look better or worse than mine? 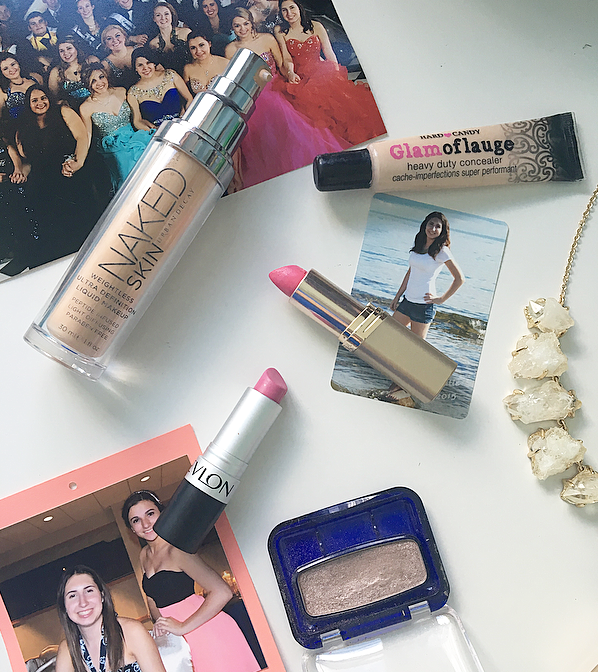 8 comments on "How I Did My Makeup in High School "
I love using the glamoflauge concealer and it was actually mentioned in my August favourites! It covers so well! It really does, I just wish it came in a broader shade range! I love hearing about what people wore at school, my look was absolutely awful I look back at cringe. It's good you went for the "natural" look, it could have been a lot worse! I like your prom picture! I did not wear foundation at all in high school or brows. Black eyeliner pencil and eyeshadow were my main staples, maybe a gloss or lipstick and blush if I wanted to feel more glam. I got irritated with the girls that wore too much makeup too, haha! I now wish I wore more makeup, I think I would've felt more confident (though teenage years, you are insecure no matter what), but the guys would've been jerks about it...but who cares!